If you're thirsty for a dirty martini, a nice, clean drink ticket can help. 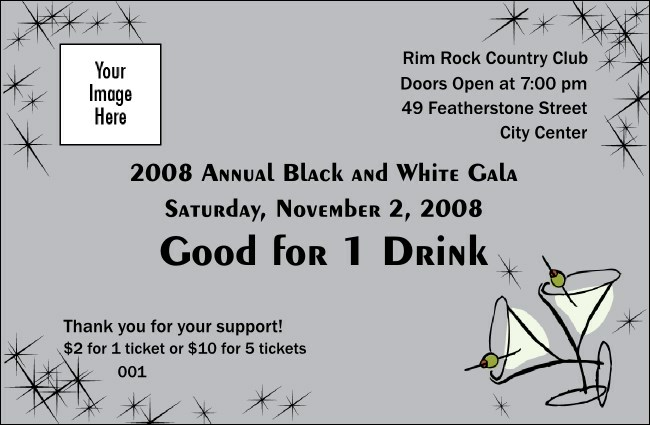 Drink tickets get your patrons excited for the big night, and the Gala drink ticket, provides a taste of how exciting it will be. With a pair of martini glasses, complete with skewered olives, this ticket template gets the party started and promises formal, fancy fun. Feeling shaken and stirred? Simplify your life with publicity materials from TicketPrinting.com.